This black Crystal Hookah is a waterpipe that will make your smoking dreams come true! It is a unique piece of glass art consisting of several integral parts. 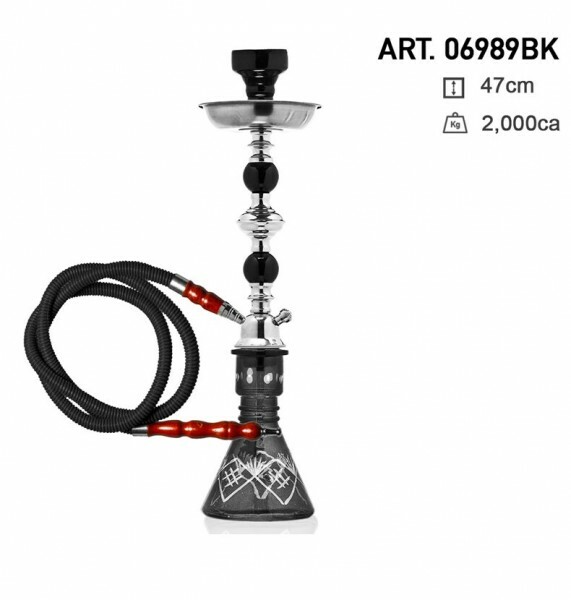 On top of this masterpiece of 47cm height there is a black ceramic bowl for placing your favourite hookah tobacco or gel. The ceramic bowl is attached to a stainless steel charcoal holder - used also as an ashplate - through a rubber spacer wrapped around the head base. The stainless steel pipe stem, decorated with 2 black crystals, comes down to an oval base connecting to a filter pipe that slips inside the water container for filtering the smoke. Finally, the whole set-up includes 1 hose and a tong for taking hold of the coal.